Have you ever seen Disney’s Sleeping Beauty? In the movie, two of the fairies, Flora and Merryweather, decide to make a dress for Princess Aurora’s 16th birthday. All throughout the movie, they argue about what color it should be. 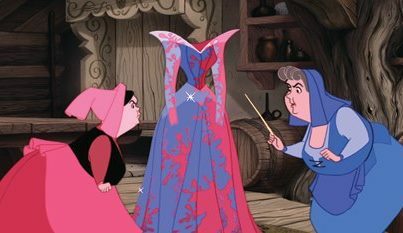 Flora insists that it should be pink, but Merryweather wants it to be blue. I am now having the same debate with myself over what color my blog should be. I started out with a pink blog with dogwood blossoms at the top of the page, but my other option is a blue background with forget-me-not blossoms. Both are equally pretty, and I keep going back and forth on whether or not my blog should be pink or blue. Flora and Merryweather never settled their argument over choosing either pink or blue for Aurora’s dress, so I have no one to emulate as I try to make this decision. Therefore, I am asking you. Which color should I use: pink or blue? Feel free to comment below. I might go back and forth between the two options over the next few days, so you might get a chance to see both. So…this is my blog. I’ve kicked around the idea of starting a blog for the last year or two, so I finally decided to go ahead and start one. To be honest, I don’t know what all I’m going to write on this blog. I like to write as a pastime, but I don’t know if any of my random thoughts would make up a cool blog that people will want to read. I guess that’s okay, though. At least I can say that I tried blogging. I’m still in the early stages of making this blog my own, so please don’t judge this book by its cover. 🙂 Hopefully it will have more personality fairly soon.